In a dramatic about turn, the Government of Mexico has agreed to reimburse the United States in full for the money President Trump will spend building his wall. “When your President originally said we should reimburse you for everything, we thought it would be billions of dollars which it to much. But zero dollars? Sure! President Andrés Manuel López Obrador says he has already cut a check that is on its way to the White House. 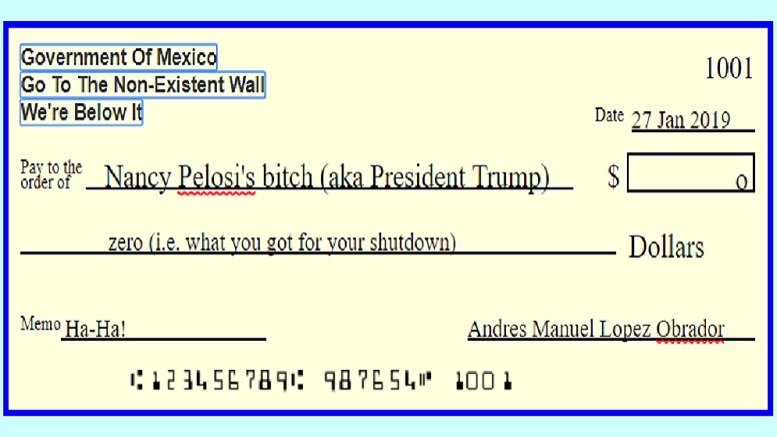 He added that he will be happy to cut another check for zero dollars after Trump shuts down the government again in a few weeks. Be the first to comment on "Mexico Agrees To Reimburse Full Amount Trump Negotiated For Wall"